For thousands of years China has been an exotic mystery that drew travellers and would-be conquerors alike to its vast territories. Modern day China has 1.3 billion inhabitants and will undoubtedly overtake the United States sometime in the next 30 - 50 years as the world's greatest manufacturing and industrial centre of power. We took neither traders nor conquerors but travelling Toffs on a 10 day trip, based mostly in Beijing but with a 3 day excursion to Xi'an to see the Terracotta Warriors, possibly the 8th wonder of the ancient world. TOFF was established in 2002, when Carlie Newman retired, as a "not for profit" organisation to continue taking people on annual trips to the European Parliament in Strasbourg or Brussels. These had been organised by her annually over some 12 years when she was director of a London wide charity for pensioners. Carlie and her husband Steve then decided to spread their wings (literally!) and took 35 Toffs to Moscow and St.Petersburg in 2004. This year the "China Choice" trip took 21 of us even further on the magic carpet (courtesy of Air China). Our travel organisers in the UK were Greencastle and their courtesy, efficiency and sheer dedication (especially when we hit problems with the Chinese authorities in London over visas) were first class. In China we were guided in a most efficient and friendly manner by CYTS; special thanks to John Qian, Sales Manager, Francis our ever cheerful and caring guide in Beijing and Frank in Xi'an. In Beijing we went first, of course, to Tianamen Square and were awestruck at its size; it took ages to cover it all. The count down to the Beijing Olympics in 2008 reminded us of our own (at that time) Olympic bid. The Temple of Heaven was lovely and the grounds were most interesting, too. Everywhere we went we ended climbing loads of steps, but nothing could compare to climbing the Great Wall (at Bodaling). Steve took a brave party of 4 intrepid ladies, one of whom needs a stick for walking, up to the top of the Eastern Section of the Wall. This involved a walk of two hours and climbing many hundreds of steps, some of which were over a foot high. Climbing up-or is it down? Our group included a number of Afro-Caribbean women and when we sat down to rest Chinese gathered around to take photos! They also seemed intrigued by two women with grey/white hair as older Chinese women have natural or dyed black hair. We also went to the valley of the Ming Tombs and walked (well, some rode in a cart) along the Sacred Way and to the Summer Palace. A novel experience was our visit, travelling by rickshaw, to a retired Chinese gentleman and his wife in the Hutong area. Our group enjoyed conversing with him via an interpreter about his life, seeing his simple but comfortable accommodation and visiting the birds in his small garden aviary. As we entered Xi'an some 20 young men and women, who were dressed in traditional costumes, greeted us on our arrival at the city gate and performed an ancient welcoming ceremony. We were each given a 'golden' key and souvenir address in Chinese. We later toured part of the ancient city walls. In the evening we attended a Tang Dynasty show, which was terrific, with spectacular costumes and amazing music and dancing. The Terracotta Warriors, which were definitely a highlight of our visit, were awesome: the scale of the tombs and the amazingly lifelike figures impressed all of our party. 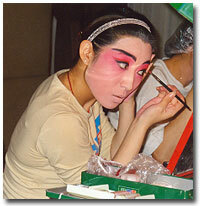 On our return to Beijing we visited the Beijing Opera, where some of us were especially interested to see the artistes applying their remarkable make up beforehand. The opera was very entertaining and different from any western show - a simple story told in speech, song and acrobatic dancing and mime. "The travel went very well and the guides were very good. I really enjoyed the excursions. Both hotels were very good. I liked learning to use chopsticks and I enjoyed the food. Beijing was unexpectedly go-ahead and had very interesting buildings both ancient and modern. We had a very harmonious group." (Marion, age 77). From Jane, who climbed Eastern side of the Great Wall with her walking stick, "Travel arrangements excellent. Hotel accommodation - perfect! Excursions good, but would have liked more time at some of the places, e.g. the Great Wall. Dining out (Jane is vegetarian) was appetising."